Have you got your hands on the eclipse stamps yet? I hope one or more will come to me by the end of next month. Haven't received a succulent global yet either. Am I the only collector whose stamps NEVER have the same kind of watermarks that are given as examples in books and on resource sites?? Did you mean they don't appear as clearly on your stamps as they do in the book/internet examples? Posting note to self -- use Liberty Bells on all snail-mail to kacyds. They don't appear clearly, no. But what I do make out rarely looks like the picture. No, you are not...trust me. What watermarks are you trying to identify? Those stamps from Argentina? Posting note to self -- use Liberty Bells on all snail-mail to kacyds . I'm sure they are better than printed labels. Post with my first succulent global forever arrived. Well those too, but the latest are the Queen Elizabeth II 1952 series from Great Britain. It just amazes me how I can look at it for 30 minutes trying to compare it to half-a-dozen examples and still not be able to come to a solid conclusion. I could make out the "v" in the middle and kind of recognize parts of the "G" and "R", but could not see any crown at all. 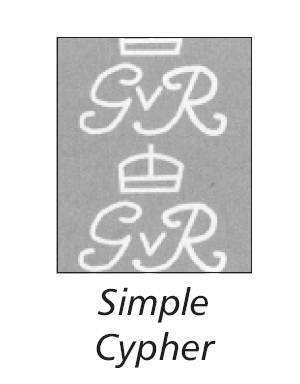 I can understand...without looking at a catalog, if I remember correctly, the crown is the key for this watermark isn't it? I usually set these aside and come back to them, hoping that at some point I will find the same stamp with a legible watermark for my album. Change it to "What kind of stamps to put on mail sent to kacyds".